I have the day off from work today so I took some time to clean my room and tackling the mess that has become my vanity. In the process, I poked around my makeup drawers and pulled out more bits that survived my previous purges (the most recent of which was just last month here). When I have the time, I'll swatch things I haven't touched in awhile and try to come up with some new combinations of looks. The above products are ones I never use for one reason or another and I don't see myself reaching for them in the future. I've purchased several large eyeshadow palettes in the past few weeks, essentially doubling my large palette collection. Thus, I had to let go of some eyeshadows in my stash. I really liked the Maybelline Expert Wear Stylish Smokes Quads when they were in the equal sized pans. This Plum Smokes quad seems to have dried out or something because I can't get the shadows to apply nicely on my skin anymore. I don't have as much of a hard time with the older shadows which is interesting to note. 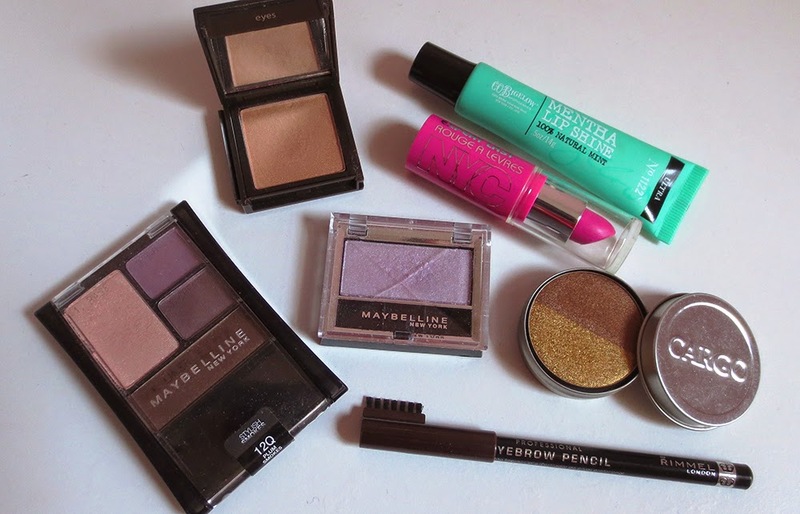 Another Maybelline eyeshadow is the Eyestudio Mono Eyeshadow in I Love Lilac, a single I purchased in Amsterdam. Unfortunately this shadow has always been sheer and patchy, so it has no place in my collection. The Jouer Powder Eyeshadow in Caramel is a lovely golden tan shadow but the packaging of the one I own is defective and glue seeps through the plastic, making this messy and difficult to open. I just don't have the patience to pry this open every time I want to use it. Then there is a Cargo Eyeshadow Duo which has no shade name on the packaging. The bronze half is one of the most buttery, smooth and pigmented bronze shadows I've touched but the gold side is chunky and a pain to use. I don't think I've ever actually done an eye look with this duo. The Rimmel Professional Eyebrow Pencil in Dark Brown was the first eyebrow product I ever purchased but I rarely ever used it. The shade is too dark and too warm for my complexion and hair color. I prefer ashier eyebrow shades. I received the NYC Expert Last Lip Color in Forever Fuchsia in a Voxbox and at the time I thought it was a fun shade but now I realize I never wear such hot pinks. Similarly, I got the CO Bigelow Mentha Lip Shine in a Birchbox a long time ago and never reached for it. It's rather addicting to weed out products I don't care for from my collection. I've been watching a ton of declutter and project pan videos on Youtube. However I've been hauling like a madwoman lately so I won't pretend like I'm making much progress in terms of downsizing my collection. I'll be passing this handful of unloved bits to my younger cousins and see if they fare better with some of these products.